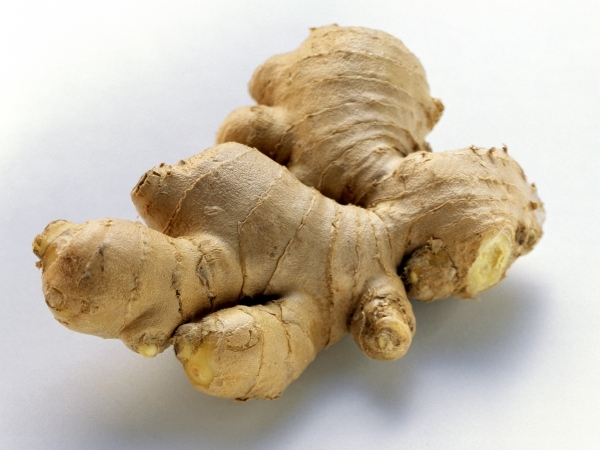 Ginger root comes from the Zingiber officinale plant and is more than just a spice. These roots add valuable nutrients and depth of flavor to many Thai dishes. Ginger can have positive effects on your digestive system and might help alleviate stomach upset and other intestinal problems, as well as help protect you from several potentially serious disorders. Using ginger can help soothe your stomach, according to the University of Maryland Medical Center. It may also suppress nausea and vomiting caused by motion sickness, pregnancy, chemotherapy or surgery. In a comprehensive review of ginger as a treatment for nausea and vomiting published in "British Journal of Anaesthesia" in 2000, the authors evaluated six clinical trials in which ginger was used to treat these conditions. They concluded that ginger was more effective than a placebo in all cases and equally effective as anti-nausea drugs in some situations. Ginger is traditionally used to improve inflammatory conditions such as arthritis, a use supported by modern research. For example, in a clinical study published in "Arthritis and Rheumatism" in 2001, 247 subjects with knee arthritis took either ginger extract or placebo for six weeks. Those who consumed ginger experienced significant lessening of knee pain when standing or walking, compared to the placebo group. Sloan-Kettering also says that compounds in ginger might protect against Alzheimer's disease and inhibit aggregation of platelets in your blood, potentially lowering your risk of blood clots and stroke. It also reports ginger might block growth of cancer cells, at least in the laboratory, but research with human subjects is needed to confirm its cancer-fighting potential. Fresh ginger root can be minced or grated and added to food. Dried ginger root or ginger extract is also available. Ginger is generally considered safe, although it might cause heartburn, mouth irritation or diarrhea, especially if you consume large amounts. The maximum safe dose is 4 grams of ginger daily for healthy adults, and 1 gram for pregnant women. Do not take ginger if you have gallstones, fever, diabetes, a bleeding disorder or heart disease. Ginger might interact with some medications such as blood thinners or insulin. Discuss its use with your doctor.